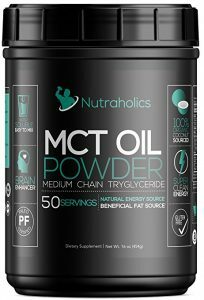 The Nutraholics MCT Oil Powder is one of the convenient ways to ensure a good intake of healthy fats. Made from organic coconuts, the powder is one of the best solutions when it comes to improved fats intake. This is why it is used in very low carbohydrate diets such as the Ketogenic diet. There are 50 servings in a pack of the oil powder and each serving delivers 7 grams of healthy fats which are fast to absorb. One serving of the oil powder is recommended for people following a typical 2,000 calorie diet. The supplement is one of the best solutions when it comes to proven fats which can boost your energy levels. Made to support the lack of energy which might come from a low carbohydrate intake, the oil powder can be one of the supplements which boost the overall quality of your fats intake. With this approach, you can see great weight loss results with diets such as the Ketogenic diet. It is known that such fats can improve the ketone levels in the blood which are then used as a direct source of energy instead of the typical glucose from carbohydrates. This is why active people keep one of the essential areas under control and this comes with energy. Since you don’t want to necessarily sacrifice your energy levels even during the weight loss process, the oil powder can come as an aid in this perspective. 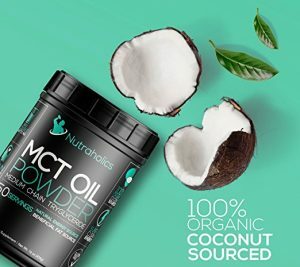 How to Drink the MCT Oil Powder? But when it comes to actually using a practical way of consuming the product, which is the best approach? One of the interesting elements comes with the ability to see the good variation for the use of the oil. In other words, you can mix it with a range of liquids to easily consume it at any given time. One of the recommended solutions comes with coffee. You can simply add the powder to your morning coffee to create one of the best solutions when it comes to improved energy levels for the entire day. Using the same principle, you can choose to add it to green tea or matcha tea as well. With a good intake of energy and antioxidants, the drink can offer the support you need when it comes to better overall energy. Even more, they prove to be easy to consume and this is why it is essential to reduce the time needed to prepare the drink, especially if you consume it early in the morning when you have limited time before going to work or to classes. But it is also important to note that you need to follow the supplement with a strong diet and this is where your daily efforts will mean the most on the long-term health and weight loss goals.